Video would have to be combined with other curriculum materials. Includes several good visualizations on the role CO2 plays in the atmosphere in regards to greenhouse effect. Comprehensive, can be broken into segments. A good video to introduce climate change and how scientists develop climate models. 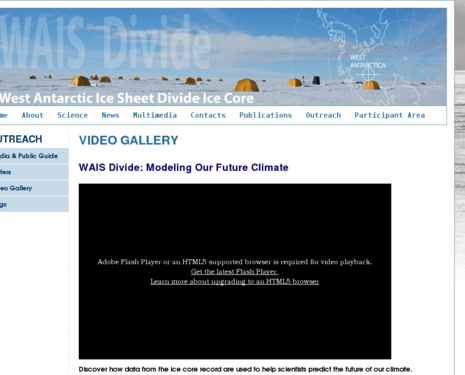 Illustrates how data from the ice core record from the West Antarctic Ice Sheet (WAIS) divide is helpful in predicting the future of our climate. Comments from expert scientist: This video contains good overviews of a number of topics relevant to teaching climate change. Namely: the use of ice cores to analyze historic climate; climate models (mentions validation with historic data); a little on the physics of greenhouse gases; and the impact of ocean uptake/release of CO2 on the climate. Good examples are given of how evidence is gathered to produce climate models. Examples from long time cycles. Produced by a professional videographer - excellent quality.